Remember – being asked to stand up in a wedding is a true honor. Let this statement rule all of your questions, thoughts, actions, etc. from the day you are asked to the day after the wedding. Being a bridesmaid is definitely a task that demands a lot of a girl – so only accept if you’re up to the challenge! A sounding board, idea generator and shoulder to cry on to the bride. Engagements are when brides need their girlfriends the most. Try your hardest to be available and helpful when you can – trust me, you’ll want the same some day! Be her beacon of hope, oasis and best friend. As a bridesmaid, you take on the role of a wedding helper bee. Turn on your inner Martha Stewart in order to help the bride with whatever she needs – addressing invites, gluing placecard pieces, organizing response cards. Make sure you’re following directions and ancipating needs when it comes to your dress, jewelry, shoes, etc. for the big day. Be prepared to spend money on these things and make sure to communicate with the bride about ideas, decisions, shopping days and purchases. Nothing is worse than sending out an email to your five bridesmaids asking “Do you like these shoes or these shoes better?” and getting no responses. She’s trying to include you and make sure you like what you’re wearing! The engagement period calls for bridesmaids to be there for showers, bachelorette party(ies), planning nights, setting up, etc, etc. 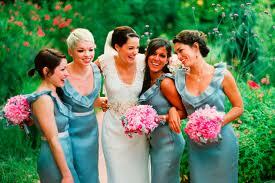 Make sure you know what is expected of you when accepting a bridesmaid position and be communicative with the bride. This is an important day – and she wants you to be a part of it…LUCKY YOU! Put together an fter-wedding meal for the couple at the reception site to have sent up to their room.